This site is best viewed at 800 X 600 or 1024 X 768 resolution with a fast broadband connection. Custom Shades is a multi-award winning design and construction company specialising in tension (or tensile) membrane and shade cloth structures. 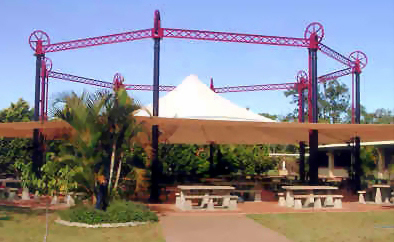 We specialise in creative, innovative and cost-effective solutions to your shade problem ... whether they be covered areas for car parks, pergolas, umbrellas, school playgrounds, grandstands, or restaurant alfresco dining areas. Our motto says it all....Whatever you have in mind for that special project, Custom Shades will work with you and your ideas to create an effective solution. Custom Shades can create that landmark building, that iconic feature, no matter how small or how large, that will set your construction apart from your contemporaries.